When it comes to breaks, students like to compare how far they have to travel. Some students drive for half an hour, while others need half a day and multiple stops at gas stations. For two Cedarville cross country runners, sophomore Jodi Davis and freshman Cheyenne Applegate, home is over 4,000 miles away in Anchorage, Alaska. It takes 60 hours to drive there from Cedarville, and a one-way flight costs over $1,000 and takes 12 hours. Davis’ entire family lives in Alaska, including all three of her older siblings who have graduated from college and moved back to Alaska. Applegate’s older sister has also graduated from college and moved back to Anchorage. But tough as it may be to spend holidays and breaks away from family, Davis and Applegate said living in Ohio has helped them mature and gain a better appreciation for their home state. Davis said she has already learned a lot by living so far away from home. Anchorage is four time zones behind Cedarville, which means even calling home needs to be scheduled. Applegate calls home every Sunday night, but she said the calls can be difficult even when scheduled. 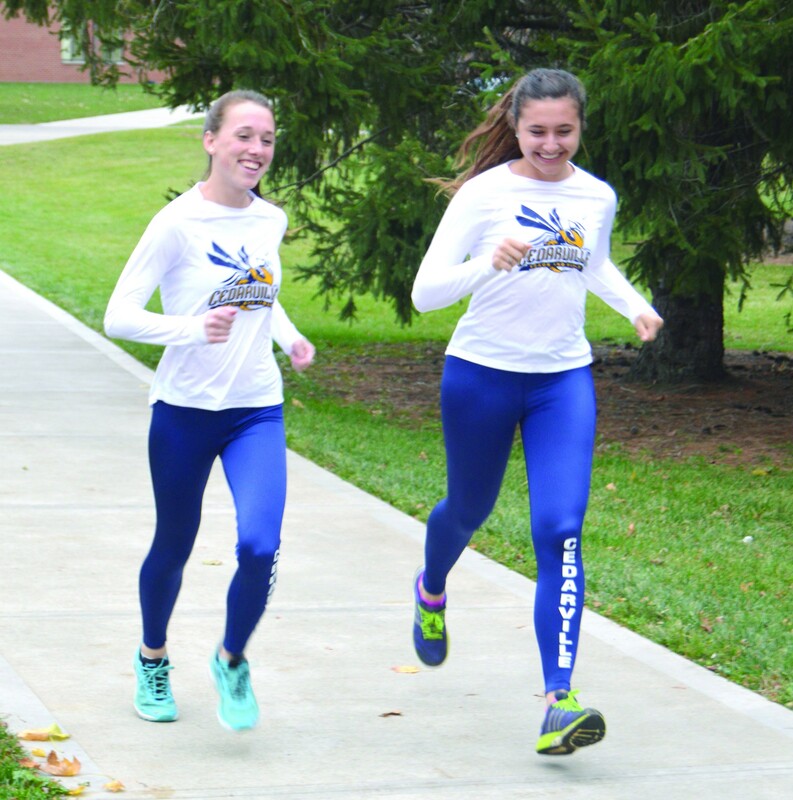 photos by Rebecca Carrell: Freshman Cheyenne Applegate (right) and sophomore Jodi Davis are both nursing majors and members of Cedarville’s cross country team. The two made the 4,000-mile trek from Alaska to Ohio for college and plan to return to The Last Frontier once they finish their education. For Davis, the decision to attend Cedarville stemmed from the university’s academic programs and its Christian atmosphere. “There aren’t any good Christian colleges in Alaska, and I wanted to go to a Christian school,” Davis said. She said she heard about Cedarville Univeristy through her brother, who is a Cedarville graduate. In the end, only Cedarville had everything she wanted in a school, Davis said. Applegate said Davis enjoyed her freshman year and was eager to share the college experience with her longtime friend, Applegate. It turns out there are reasons not to go to Ohio. Transitioning to a new climate was the first of many challenges that come with being so far from home, Davis said. Applegate said she will never forget her first workout at Cedarville this past August. Winter is also a challenge for Alaskans, which Davis said surprises most people. It’s not just the weather, though, that separates Alaska from Ohio. Geographically and culturally, Anchorage is a world away from Cedarville. Anchorage is the biggest city in Alaska, with a population similar to that of Cincinnati. Despite this similarity, Davis said Anchorage doesn’t have a big-city feel to it the way other cities do. The duo said the track team they ran with in high school would travel several hours for meets and see nothing but mountains and trees along the way. At Cedarville, travel time is rarely more than a couple hours, and many towns are passed along the way. Without an abundance of movie theaters, sporting events and malls, Alaskans find fun outdoors, Davis said. She said one of her family’s favorite outdoor activities is hunting. Applegate said even in the winter Alaskans find ways to get outside. It’s these differences that make both Davis and Applegate want to move back to Alaska after college, Davis said. Applegate said living in Ohio has only grown her love for her home state. But wherever God takes them, Davis said Alaska will always be special. “If Alaska was cut in half, Texas would be the third biggest state,” Davis said. 1 Reply to "A Cross-Country Move"
I’d like to visit Alaska some day, I love winter and when snow crackes under the feet. Its nature and atmosphere attract me.